Should you put a kitchen sink on the island? Some love the idea of an uncluttered island and others love the idea of using the island as a food preparation area, in which case a second sink would be extremely useful. 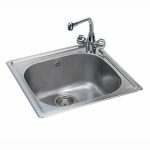 If a Kitchen sink on your island is on your wish list, your final decision might be dictated by the size of your island / kitchen, the layout of the units underneath (in) the island and whether or not a kitchen sink / kitchen tap can be plumbed. Is your island big enough? 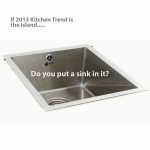 If you are putting a kitchen sink into your island, then make sure that you plan where the seating area is and which part of the island is going to be your food preparation area and plan to put the kitchen sink down that end of the island. Whilst a kitchen sink situated in the middle of the island might look nicely symmetrical, it does divide your worktop space in two. What kitchen sinks to put on your island? so the material that the worktop surface is made out of should accommodate this. Whilst real wooden worktops are very popular I am personally not a fan of a sink being undermounted / set into a ‘real’ wooden area as over time there will be water damage. 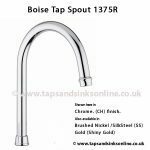 I have seen this issue being solved by a water resistant material being used around the kitchen sink area (e.g. granite, composite, wood look alike articificial worktop etc) and real wooden surfaces being put in other parts of the kitchen. 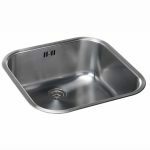 Size of kitchen sink: Make sure that it is big enough to comfortably wash hands, wash vegetables, rinse bowls etc under. 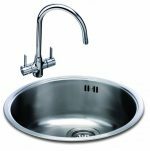 The size of sink might be dictated by the layout of the units in the island so it is very important to work closely with your kitchen designer at the early stages when deciding on where to place units etc as these always dictate the size of your kitchen sink. to coloured granite (Carron Phoenix Fiji Range) to ceramic (Carron Phoenix Carlow 150). 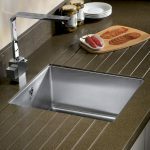 The rest of your kitchen style will pretty much dictate the style of sink e.g. 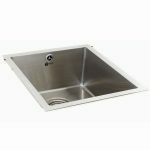 if you are putting a stainless steel sink in another area of your kitchen, then ideally you would match it with a stainless steel sink on your island. If you have curve details in your units, then you might put a round sink on your island to mirror the curves etc. For ideas of kitchen islands, with or without kitchen sinks, you could look at my pinterest board ‘kitchens – island units’. 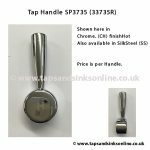 We are a specialist online store that stocks a selected range of products that we can provide all the technical information on and troubleshoot any problems associated with (no matter how old). 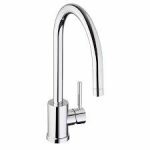 We have been selling San Marco Kitchen Taps and Carron Phoenix Kitchen Taps for over 20 years. 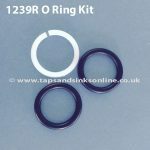 Not only do we stock the spare parts but our technical department can troubleshoot most problems for you – no matter how old or new your kitchen tap is. Excellent After Sales Service is an intrinsic part of our Customer Care ethos.